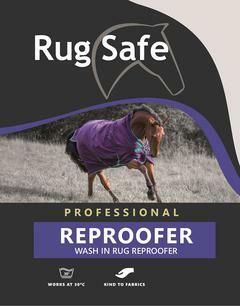 RugSafe is a specialist equestrian laundry supplier based in Hampshire UK. The company was first founded after identifying the equestrian laundry market lacked a superior solution that could keep up with the technical fabric of modern rugs. We have over 20 years experience and expertise in equestrian laundry solutions and pride ourselves on delivering a fast, reliable and professional service worldwide, continually developing our products to offer you a complete tailored solution from our specialist range. As well as our uniquely formulated rug washes and re-proofers we can also supply all your equestrian laundry repair and day to day running requirements from buckles to straps, velcro to waterproof fabric, labels and bags, order pads and tags. Our rug-washing products offer superior cleaning for all types of rugs at only 30 degrees, thereby saving you time, money and water. They are specially formulated and will not damage the delicate material of turn-out rugs but also include anti-bacterial properties which destroy any odours. We also provide a wash-in reproofer and a spray-on reproofer, both of these leave no residue on the rugs or in your machine and the wash-in version can be popped into the final rinse instead of having to run a whole new cycle. We have extensive contacts throughout the industry which mean we can offer complete support service. RugSafe UK are a one stop shop for all your laundry requirements. 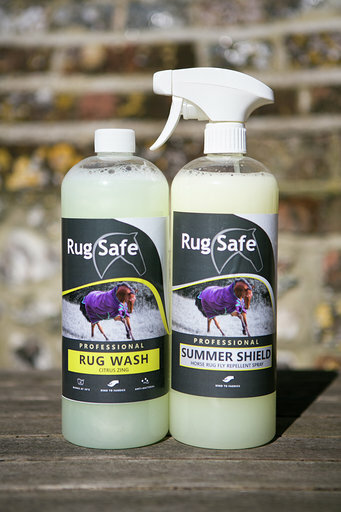 For professional and personal use with superior cleaning and built-in antibacterial properties, RugSafe washes are the perfect products for washing all varieties of rugs and horse wear; will not damage the delicate material of turnout rugs or affect the waterproofness. 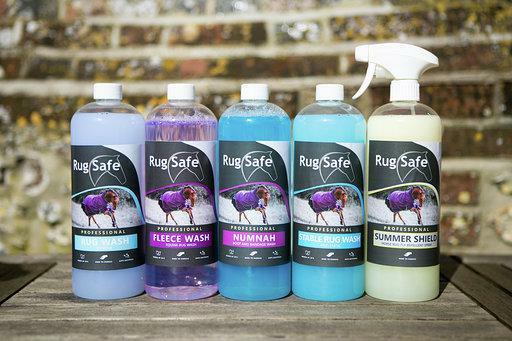 RugSafe UK manufacture and supply horse wear washes for all requirements including; Fleece wash, Merino & Wool wash, Expel wash, Numnah, Boots & Bandage wash, Stable rug wash and Sheepskin conditioner. For professional and personal use. RugSafe Re-proofers will reproof all types of turn out rugs after washing. a blend of proofing agents maintains the breathability of the fabric whilst leaving a durable proofing film that is oil, water and soil repellent. RugSafe UK manafacture Wash In re-proofer and Spray On re-proofer. RugSafe UK pride ourselves on being a one stop shop for all your laundry requirements and can supply a huge range of repair fixtures and fittings, as well as supplying all laundry accessories.